Exactly six months ago, I published Chaos, an action/adventure novel along the lines of Indiana Jones or books written by Clive Cussler, James Rollins, Douglas Preston, or Steve Berry. It deals with all the things we love here at Guerrilla Explorer…forgotten history…stolen treasure…strange science…and the “lost world” of tunnels under New York City. So far, I’ve been thrilled with the reception, both in terms of customer feedback as well as the nothing short of phenomenal sales Chaos has enjoyed across the globe. For those of you who’ve been asking, a sequel is coming soon…very soon! Chaos is the debut action-adventure novel from author David Meyer. The story follows the exploits of Cyclone “Cy” Reed, an archaeologist running from his past. Reed is hired to solve a mystery but he gets much more than he bargained for. On May 18, 2007, Odyssey Marine Exploration flew 17 tons of salvaged gold and silver coins to a secure facility in Florida. Now, five years later, U.S. courts have forced Odyssey to hand over this treasure to the Spanish government. What is the Black Swan Heist? Odyssey & the Mysterious Black Swan Project? Odyssey is a publicly-held marine salvage company. In other words, it’s a treasure hunting firm. Back in 2007, Odyssey completed a top-secret salvage expedition known as the Black Swan Project, uncovering some 17 tons of coins and other artifacts in the process. The operation is believed to have cost two million dollars and taken numerous years to complete. Almost immediately, the Spanish government filed a claim on the treasure, arguing that the Black Swan was actually a Spanish vessel known as the Nuestra Señora de las Mercedes, which sank in 1804. Five years of court battles and drama followed. At one point, WikiLeaks even got involved. A secret cable revealed the American ambassador to Spain offered to help the Spanish government recover the treasure from Odyssey. In exchange, Spain was asked to compel a museum in Madrid to return a $20 million painting to a California family that claimed it had been stolen by the Nazis. In September 2011, the 11th Circuit Court of Appeals ruled against Odyssey in a highly questionable decision. In February 2012, Justice Clarence Thomas, acting on behalf of the U.S. Supreme Court, declined to hear the case. As a result, Odyssey is being forced to hand over the Black Swan treasure to the nearly-broke Spanish government. And in a slap to the face, the firm won’t receive any compensation for its work (leading many treasure hunters to suggest Odyssey return the Black Swan treasure to the ocean and make the Spanish government pay for its own recovery). I don’t want to get into the minutia of the case here. The international laws governing shipwreck salvaging are murky and highly tilted toward governments over individuals. Suffice it to say the Black Swan wreck was never conclusively proven to be the Mercedes. And even if it was the Mercedes, that means that the vast majority of the coins were owned by merchants and not the Spanish government. Spain claims it had reimbursed the merchants back in the early 1800s and thus, was entitled to the treasure (interestingly enough, it has yet to provide any proof of this compensation). From my point of view, this is a short-sighted decision that will have long-term ramifications (something I discuss in my novel Chaos). Going forward, treasure hunters will have little to no incentive to report their findings to the world. The black market for antiquities will grow. The treasure hunting field will attract a greater number of reckless and unskilled individuals. Thus, salvage work will be done with more haste and less care. As I see it, the Black Swan treasure falls under the homesteading principle. There are three possible owners of the Black Swan wreck. The dead (or their descendants), the “community” (supposedly represented by the Spanish government), or Odyssey. First, the dead merchants can no longer claim ownership. In addition, the merchants basically stole the metal for the coins from the Incas making it extremely unlikely the original owners can ever be traced (although some Peruvians are making their own claim). Second, the Spanish Culture Ministry has no legitimate claim to the treasure. Governments cannot legitimately own private property, since everything they have (including tax dollars) has been, in effect, taken at the point of a gun. Overall, I would argue no one owned the Black Swan wreck prior to discovery. Odyssey, on the other hand, is the rightful owner of its own labor. By salvaging the Black Swan, the company added its labor to the treasure and thus, became its rightful owner. I’m a treasure hunter. Yet I also consider myself an amateur archaeologist. As such, I’m very sympathetic to the concept of “historical preservation.” However, I don’t think that “stealing” artifacts from the treasure hunters who recover them is the best way to achieve that goal. Instead, I tend to favor the idea of privatizing archaeology. I realize I’m in the minority on this issue. But that doesn’t mean I’m wrong. Freedom has vastly improved the lot of mankind over time. I believe it could do the same thing for the field of archaeology. Q: Sounds like my kind of book! So, is this your run-of-the mill action/adventure story? 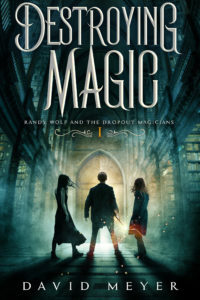 What sets it apart from other books? A: I should start out by saying that the seed for Chaos was planted a few years back when I was tromping through an abandoned subway tunnel with my future wife (yes, she still married me!). As I passed through a particularly desolate stretch, I found myself wondering: What if someone hijacked a subway train? It wasn’t the most original question in the world. After all, a similar premise underlies Morton Freedgood’s novel, The Taking of Pelham One Two Three. But while Freedgood saw the subway system as a unique crime scene, I saw it as a “lost world” full of crumbling ruins, dangerous natives, and metal monsters. Head on over to his site to read the rest. Thanks M! Hang on to your seat! 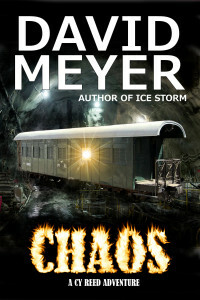 If you like roller coaster action, fast-paced adventure and the thrill of treasure, you’ll love Chaos, the suspense-filled debut novel of David Meyer. Chaos is a finely woven story full of intrigue set below the streets of New York City. The main protagonist, Cyclone Reed, is an urban archaeologist turned treasure hunter. Written in the first person, Reed’s ability to laugh at himself truly makes him appealing. The dialogue is short and witty, and just when everything seems to be wrapped-up; the story takes another exciting twist and turn. I was hooked from page one and the author kept me guessing right up to the surprise ending. Chaos has made me a fan of David Meyer, and I can’t wait to read about Cyclone’s next adventure. As a reminder, Chaos is an adventure thriller along the lines of Indiana Jones or books written by Clive Cussler, James Rollins, Douglas Preston, or Steve Berry. Thanks to those of you who’ve bought the novel already. If you haven’t already done so, please consider picking up a copy at one of the locations below. Thanks for your support!